Ella has three summits; a rope may be needed for the middle and south summits. The middle one is a split pinnacle climbed via a chimney. The southern, highest summit is climbed by a ledge on its eastern side, which can be reached from the snowfield via a col south of the peak. A major stream above George Lyon Hut falls from a large basin. Waterfalls are by-passed on the true right bank. Scree leads to a saddle in the ridge between Ella and point 1951, overlooking a small glacial remnant. From the saddle head south-west then across a permanent snowfield and up to the northern summit. 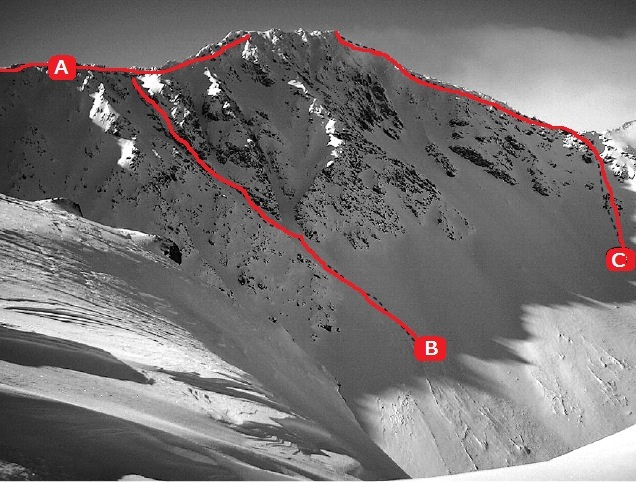 Long routes lead over Crag and up to Peak 2189 (used on the first ascent of Ella), or from the tops south of Peak Creek, but it is easier to reach Pk 2189 from the head of McKellar Stream. Traverse the Ella Range from here. B C H Moss, J F Foster, E Chittenden, April 1952. Angle north-east up a prominent gully on the McKellar Stream face to reach the North Ridge, and follow it to the north summit and trig. The middle peak is a split pinnacle, climbed via a chimney. The south summit is climbed via a ledge on the D’Urville side. A rope should be used for the traverse. Descend by any suitable gully. A marked track up McKellar Stream gives access to the West Face. From the end of the track angle south-east up scree on the face to a saddle (1966m) below the south ridge. Climb up to the south (high) peak. Turn its steep southern face on the D'Urville side. Direct routes on the face are possible in winter.